Week nine is in the books and we saw plenty of chaos occuring at the end of the top 25. We also saw some shifting at other various points, and races for top two or three spots in the Pac-12 and Big Ten continue. The top three overall continue to separate themselves, but really the biggest takeaways from week nine are some of the other teams. Note: It’s impossible to get to every match and every team for the sake of you not getting bored on this page or my fingers falling off from typing, so we try to cut it down a bit. Who is the second best team in the Big Ten? And what’s the importance of that? At this point, Minnesota has pretty much established that they are the best team in the Big Ten. They are 10-0 and everyone else has two or more losses. So to this point that’s been the case, but who should be viewed as their top contender and the second best team in the league right now? Well, there may not be one specific answer. And even if you do feel comfortable giving one, that likely has changed from week-to-week lately. Nebraska, Penn State, Illinois and Wisconsin all have potential for this spot – and who knows, maybe Michigan could go on a late run to supplant their strong first half. As of now, Penn State would probably be the flavor of the week but they still have at Nebraska, at Illinois and home meetings with Wisconsin and Minnesota. Wisconsin and Illinois had nice weeks too, while the Huskers can’t be discounted. Whoever does emerge in that spot – which maybe comes from overall resume or based on league standings – will have an edge toward hosting through the regionals in the NCAA Tournament. The top three overall have been pretty solid with BYU, Stanford and Minnesota, but that fourth spot is up for grabs. It’s possible an undefeated Pittsburgh gets it, while Texas and the SEC champ could contend. But based on overall resume the top of those teams would probably be my pick for that last spot, which comes with home court advantage, so is obviously important. Kansas scored a huge upset over Texas to take the league lead, but it lasted one week before the Longhorns regained it. Still, Texas has shown some weakness but appears ready to run away with the Big 12 once again. Outside of that, things are just wacky in the league. Baylor was the preseason favorite to challenge Texas. They’ve already lost four conference matches. Kansas just had their moment, and still should be okay but now fell off a bit. Texas Tech surged early and is now 4-4. Iowa State has gone through injuries, but just upset Kansas. Kansas State was ranked in the non-conference, started 0-6 in the Big 12 and now got two big ones – one over Kansas. The league is making no sense right now, and there doesn’t seem to be a true hierarchy outside of Texas. But at the end of the day it’s showing off the Big 12’s depth and the fun aspect of the conference in that anything can happen on any night. The Golden Knights had a big week. 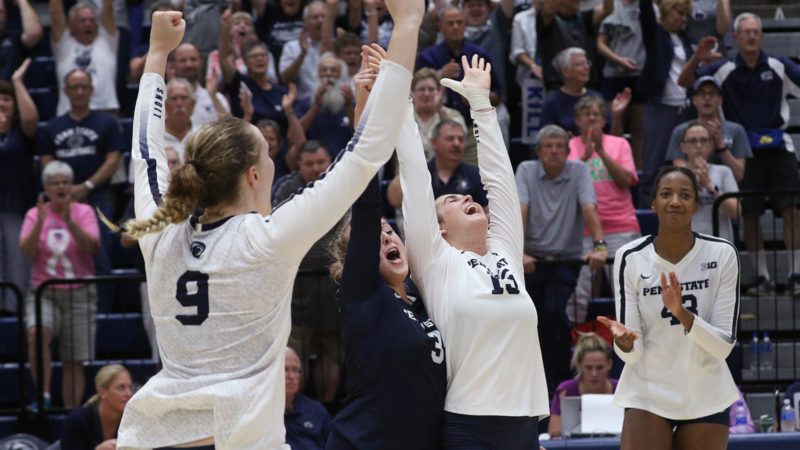 They stayed unbeaten in conference play, won their 15th straight and got a five-set road victory at (RV) Cincinnati – their biggest foe in the league title race. So therefore they’ve now got a huge step in the race toward a league title, especially winning at Cincinnati. They continue to roll too and with the win only helping their resume, their RPI continues to be confirmed. It doesn’t hurt that they have that win over USC in their back pocket, who also is looked kindly on by the RPI. They’re in a great spot to host in the first couple of rounds of the NCAA Tournament if they can keep grabbing victories and if they win out it seems like a foregone conclusion. That’d be quite the boost for the conference – after they had another host in 2017 in Wichita State – as well as UCF as a program.